A city like no other will be built deep in the New Mexico desert. The brand new city will feature urban, suburban, exurban and rural zones dotted with houses, malls, power plants, police and fire stations, with only one big difference from a real city: it won’t have any inhabitants. The Center for Innovation, Testing and Evaluation (CITE) will be the first of its kind, fully integrated test, evaluation and certification facility dedicated to enabling and facilitating the commercialization of new and emerging technologies. Basically, it will be a real life Sim City. A model of the city. Image via CITE City. The city is meant to simulate a population of about 33,000 people, will include a city center, as well as suburban and rural zones – following the American model of cities. There will be a city hall, airport, regional mall, power plant, school, church, and gas station; for some reason which eludes me, no hospital. I could see several simulation scenarios in which having a hospital would be useful (evacuation, disaster, etc). You want to be close to research institutions and companies that would be interested in your facilities, but then again, you want to be far away from established cities – to minimize the costs and to avoid potential influences. Then you start up with a model from a typical, regular city; of course, no two cities are alike, but many of them follow some patterns. CITE will be patterned after the very real city of Rock Hill, South Carolina—ideal as a template for its size and mixture of both old and new building materials and similar to many cities in the US and Canada. But there are some more subtle questions as well: should the city have litter on the streets like a real city? Should it feature urban art, vandalism, wear and tear? The answer to all those questions will is ‘yes’. All these elements could play a role in simulations, and therefore will be replicated. The new generation of smart cities is coming – we’re already seeing glimpses in some parts of the world. 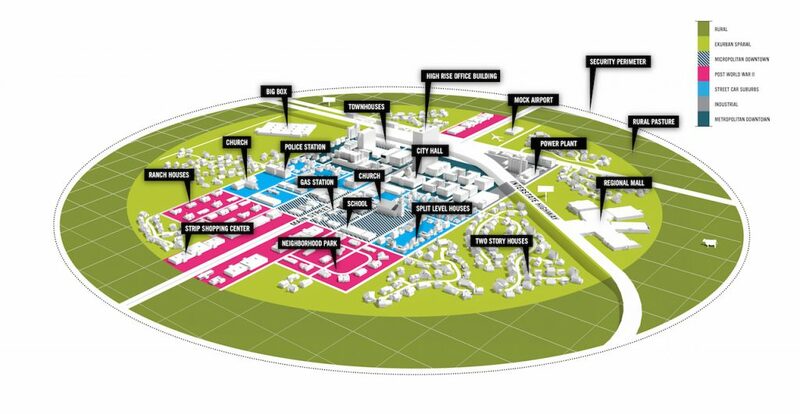 But apparently, the road to smart cities goes through an empty, spooky lab city.